knowing God will sustain me through each trial and test." has battered my spirit; left me wounded and marred. and I willingly yielded to God’s unseen hand. gives strength to endure, and peace beyond measure. knowing God will sustain me through each trial and test. Embracing my journey by God’s generous grace. as I've walked in obedience to my Father’s plan. My hand on His hem, I’m clinging to Jesus. I’ve carefully tended to the garden of my heart. Reminders of spring time now proclaim a new start. 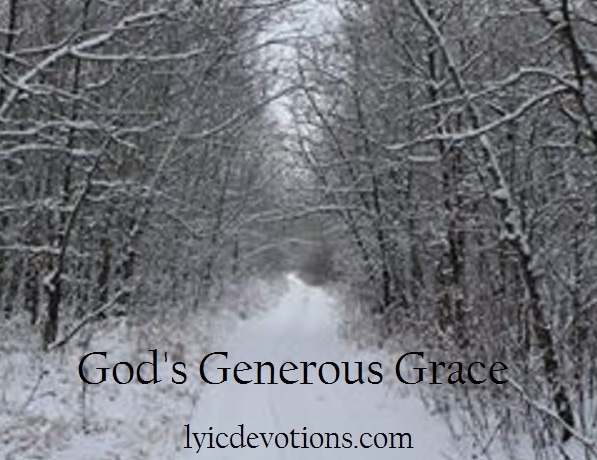 Won’t you trust and partake of God’s generous grace? I must give credit for the lyrics to Elaine, as most came from her own writings on her blog. I read many of Elaine's blog posts from the past year; copied, pasted and printed to reread and highlight. Some phrases are taken word for word, others were adapted but in keeping with Elaine's message. I encourage you to visit Peace For The Journey, and read for yourself, Elaine's wonderful words of encouragement....a beautiful testimony of God's sustaining grace through her winter season. 1 Corintians 4:1&2 Let a man so account of us, as of the ministers of Christ, and stewards of the mysteries of God. Moreover it is required in stewards, that a man be found faithful. OK... I'm over here trying to imagine the flow of lyrics in your head to go with the beautiful music. I'm sure I'm getting it wrong, but my daughter says I sound good! At some point, would love you to sing it as you intended. Lovely, sister. Thank you. Elaine, Thank YOU, for inspiring me to write this song! If it helps....there is a 4 bar intro at the beginning of the song, before the lyrics start. What a beautiful tribute to God's Generous Grace! Bless you Deborah, and Happy Easter! I just popped over here from Elaine's blog to here the song that you wrote. The melody is lovely and the word's inspired by Elaine's life are such an encouragement! Thank you for writing this and sharing this gift. It is beautiful. Yes beautiful and I would so love to hear it sung as well. Well, I could be a while before I get it recorded....so if there is someone else out there who might be interested, I'd be happy to send the sheet music. Absolutely beautiful!! You wrote the words of my heart! Thank you for blessing us! Sis Deb, what a wonderful song of victory in Christ! Your music and your lyrics are so touching. I'm doing very little blog reading/posting these days but wanted to say here that in encouraging Elaine as you have with this lovely song, you encourage the Body of Chirst. And when we encourage the Body, we bless our very Lord Himself. What better ending for the gifting, than at the feet of Jesus? Thank you for being willing. I just want to say thank you to everyone for the kind words. To God be the glory! I've enjoyed visiting all of your blogs as well, and learning of new and awesome ministries. The Lord surely does gift his people to encourage and serve each other and in so doing, serve Him. Strains of Hope, stanzas of Praise...what a lovely tribute to our Victory in Christ's Name.